Wraptherm is a composite comprising a 10mm Spacetherm insulation blanket bonded to the face of a Wraptite vapour-permeable, airtight self-adhesive membrane. It is designed to improve airtightness levels combined with a reduction in thermal bridging. Developed for use in the refurbishment of existing buildings where there is a requirement to enhance both the thermal and airtightness performance of the building. Wraptherm can be applied to the internal face of the existing façade, providing a vapour-neutral yet airtight layer, fully self-adhered to the substrate layer with the added benefit of a 10mm-thick layer of high thermal performance Spacetherm insulation. 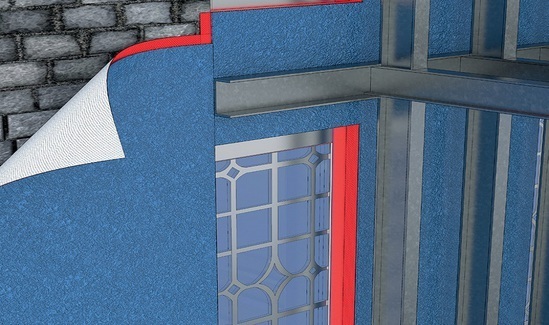 Over this airtight/thermal composite framing can be installed with the cold bridging being reduced thanks to the Spacetherm layer. Additional thermal insulation can be included within the frame to meet the U values required for the refurbishment. 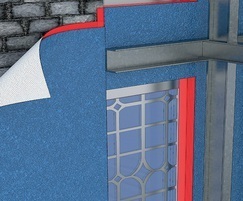 The offset nature of the Spacetherm insulation layer over the Wraptite backing allows robust sealing of the joints in the panel to ensure the continuity, integrity and robustness of the airtight layer.